Nation’s Ministry of Environmental Protection turns to Circle of Blue and the Wilson Center’s China Environment Forum for help. City officials in Urumqi are more carefully weighing the water demands of new industrial plants. For example, a proposal for a new coal-to-chemicals manufacturing base near Urumqi has encountered stiff opposition from city authorities, worried about the millions of cubic meters of water that the plant would need to operate. Click image to enlarge. Faced with diminishing freshwater reserves and rising levels of toxic air pollution, China appears ready to begin curbing the primary cause of both harmful trends — the mining and burning of steadily increasing amounts of coal to serve the nation’s utility, chemical, cement, and manufacturing sectors. Editorials in state newspapers describe the Chinese leadership as more determined than ever to simultaneously strengthen water conservation, improve energy efficiency, and accelerate the development of cleaner energy sources. China’s state news agency, for instance, announced in August a government pilot program to “control” coal consumption in a few dozen major cities, including Beijing. Urban air pollution will become the top environmental cause of death worldwide by 2050, according to a 2012 report by the Organization for Economic Cooperation and Development. Compared with emissions in 2000, SOx and NOx worldwide in 2050 are projected to increase by 90 percent and 50 percent, respectively. The Chinese government announced an ambitious plan this week to curb air pollution across the nation, including setting some limits on burning coal and taking high-polluting vehicles off the roads to ensure a drop in the concentration of particulate matter in cities, the New York Times reported. Premature deaths in China alone from air pollution will increase from 1.3 million in 2010 to 2.1 million in 2050, according to the 2012 OECD report. Air pollution will become China’s biggest health threat unless the government does more, announced Zhong Nanshan, China’s leading respiratory disease specialist and the president of the China Medical Association, in March 2012. Also in 2012, China and the EU struck a deal in September to reduce greenhouse gases through emissions-trading schemes. But China’s air pollution problems persist — Reuters reported that a blanket of smog hung over a string of northern cities in January 2013, generating widespread public anger. Travel industry executives in Beijing, Shanghai, and other large Chinese cities say they already see evidence that the nation’s hazardous air quality — particularly during the winter — is driving tourists away from China, according to The Atlantic. China’s smog problems as they relate to travel are not only within its borders, however. In March, flights were canceled in Japan as parts of the country were smothered by Chinese air pollution, according to Deutsche Welle. One of the nation’s premier science divisions, the Policy Research Center for Environment and Economy (PRCEE), a unit of the Ministry of Environmental Protection, is developing a distinctive set of scientific and industrial management practices — called “co-control” — to reduce China’s dependence on coal. The idea is to identify and implement cost-effective strategies that simultaneously reduce emissions of greenhouse gases, limit conventional air pollutants, and lower demand for coal. 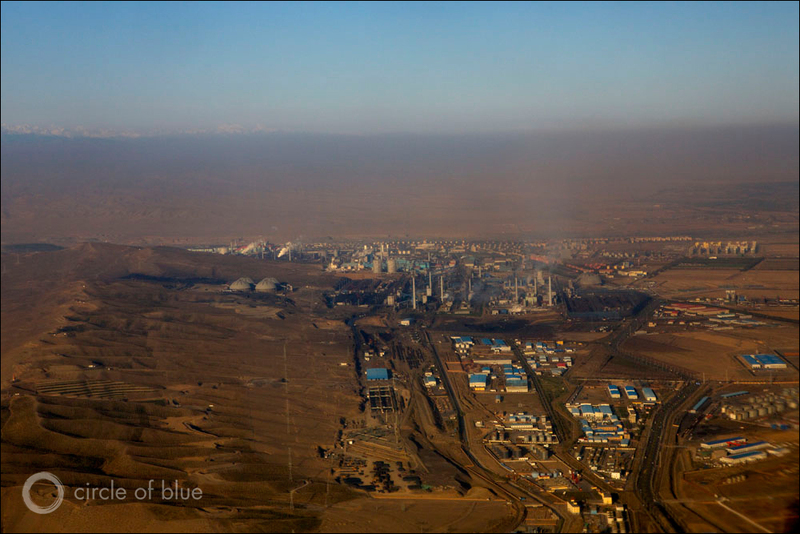 Since 2010, journalists from Circle of Blue and researchers from the Wilson Center’s China Environment Forum have traveled repeatedly to China to document the consequences to water supplies, and to air quality, from China’s use of coal. The Choke Point: China series attracted the attention of the Ministry of Environmental Protection. Over the last year, scientists with the PRCEE teamed up with Circle of Blue and the Wilson Center’s China Environment Forum to conduct weeks of field research on how two Chinese cities — Urumqi in the desert west and Qingdao on the Pacific Coast — manage their water and energy demands. The collaborative project produced a comprehensive report, funded by the Asian Development Bank, that makes the case that a two-year-old pilot program conducted by the Ministry of Environmental Protection in Urumqi to reduce coal demand can be applied in Qingdao and duplicated in other cities. The PRCEE’s co-control concept to reduce dependence on coal stems from more than 20 years of cooperation between China’s Ministry of Environmental Protection and the U.S. Environmental Protection Agency (EPA), which worked together in the mid-1990s on frameworks for improving air quality across regions. Through deploying various equipment, state-of-the-art industrial practices, and market mechanisms to reduce total greenhouse gas emissions, other toxic pollutants affecting the quality of urban air also will decline. With the help of Circle of Blue and the Wilson Center, the PRCEE recently expanded their research to incorporate water supply and use in co-control practices. The report describes how reducing the flow of water in energy-hungry desalination, wastewater treatment, and recycling plants significantly lowers the demand in China for coal-fired electricity. Click here for a copy of the study: Scoping Water and Energy Pollution Nexus in Urumqi and Qingdao for Preparing PRC’s Ministry of Environmental Protection Co-Control Program . The basic principles supporting the co-control concept make enormous sense, though achieving them in the world’s second-largest economy would be a monumental task. Coal currently accounts for 76 percent of China’s energy production and 70 percent of its energy consumption, in addition to producing the world’s highest emissions of carbon dioxide, the primary greenhouse gas that contributes to climate change. Fresh water needed for mining, processing, and consuming coal accounts for the largest share of industrial water use in China, or roughly 120 billion cubic meters (31.7 trillion gallons) a year, which is one-fifth of all the water used nationally. Urumqi is a fast-growing city in China’s desert northwest. Annual demand for coal there was 22 million metric tons in 2011, 19.4 million metric tons of which were needed to power electrical generating and industrial plants. In 2000, Urumqi’s industrial demand for coal was 5.5 million metric tons. Click image to enlarge. Production of coal in China has tripled since 2000, reaching 3.44 billion metric tons in 2012. Domestic supplies were still not enough to match demand — nearly 300 million metric tons of coal were imported last year. Government analysts project that China’s energy companies will need to produce an additional 600 million metric tons of coal annually by 2020, representing a 17 percent increase. Urumqi, the fast-growing provincial capital of 3 million residents in Xinjiang Uygur Autonomous Region, China’s far desert region in the northwest, was selected in 2010 as the first pilot demonstration of the co-control practices. Qingdao, a large and modern Pacific Coast city of 8 million residents in Shandong Province, was selected as the second co-control pilot demonstration project, and work started earlier this year. The need to reduce air pollution is urgent, especially in Urumqi, which routinely earns the lowest air quality ranking and also has the highest sulfur dioxide content of any major Chinese city. The Xinjiang government and the Urumqi government list improving air quality as one of the principal civic goals. The provincial and municipal governments plan to invest 19 billion RMB ($US 3.2 billion) over the next three years in pollution-control and combustion equipment to improve air quality. The investment will focus on reducing emissions citywide of three primary air pollutants — sulfur oxides (SOx), nitrogen oxides (NOx), and particulate matter (PM), all of which are produced in prodigious quantities from burning coal. 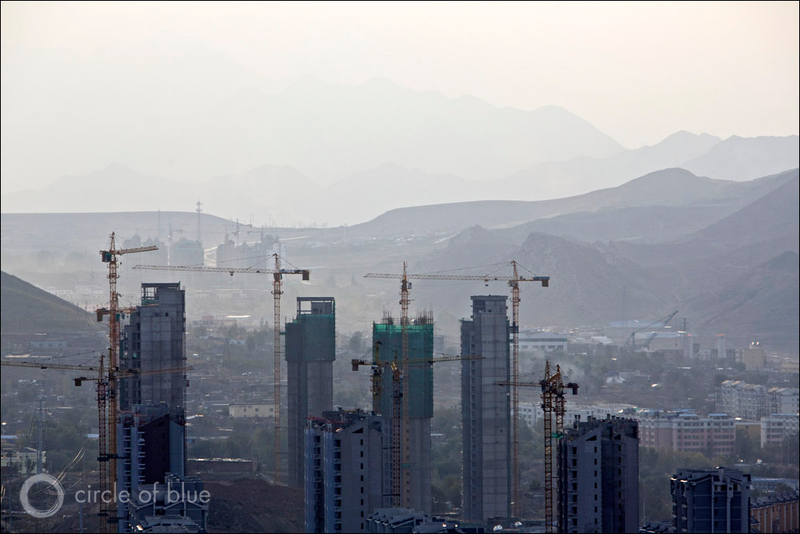 In 2009, Urumqi’s power plants and heavy industries poured 156,000 metric tons of NOx into the atmosphere. Two years later, that number had increased to 178,000 metric tons. Working together to implement co-control measures, PRCEE and municipal leaders anticipate reducing annual NOx emissions to 81,000 metric tons by 2015, according to Ministry of Environment data. SOx emissions in Urumqi reached 72,000 metric tons in 2010, and PM emissions totaled 30,000 metric tons the same year. The pollution-control measures and equipment investments that are called for in PRCEE’s co-control protocols for Urumqi would, by 2015, reduce SOx emissions to 49,000 metric tons and particulate emissions to 18,500 metric tons. Qingdao consumed 16.6 million metric tons of coal in 2011, more than twice as much coal as the city consumed in 2000. 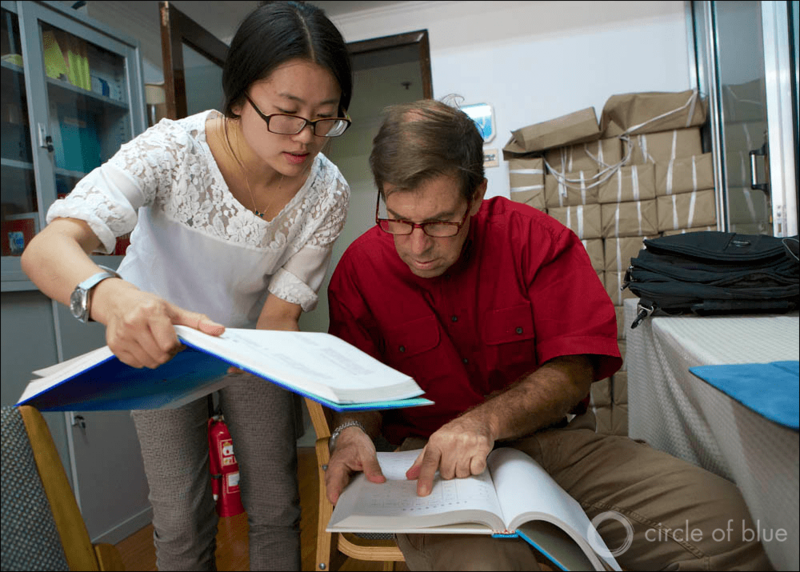 Researcher Lilian Jingyang and Circle of Blue’s senior editor Keith Schneider, the author of the new report, collected this and other water, energy, and air pollution data from the Qingdao Statistical Bureau. Click image to enlarge. Meanwhile, municipal air quality authorities in Qingdao have been working for years with the city’s industrial companies to curb air pollution, principally by shutting down the oldest factories and power plants and by doing more to enforce air quality regulations. The city’s SOx emissions in 2011 fell to 102,837 metric tons, down more than 52,000 metric tons from their recent peak of 155,351 metric tons in 2005. PM emissions, though, are climbing again, after falling from a 2005 peak. Much of the improvement in Qingdao has come as a result of shutting down old, inefficient, and polluting industrial plants in the urban core, as well as constructing cleaner modern plants in close-by rural districts, just outside the city. According to the Qingdao Institute of Science and Technology, authorities have closed 297 small coal-fired industrial boilers and 15 small coal-fired industrial power plants from 2007 to 2012. In addition, authorities ordered the closure of 10 chemical plants and eight inefficient production lines at cement, fertilizer, and paper plants. Not surprisingly, there are no easy fixes to China’s air pollution emergency. For example, one of the popular global techniques to control sulfur emissions from industrial plants is to install equipment in the air waste stream to remove the pollutant. But the so-called flue gas desulfurization (FGD) process itself consumes considerable amounts of electricity, powered by coal. Produces 0.016 metric tons of nitrogen oxides. Increases in nitrogen oxides by 135,000 to 381,000 metric tons annually. Produce 7,800 metric tons of sulfur dioxide. Urumqi authorities recognize the conflict over scarce water supplies.Farmers have closed down irrigated cropland outside Urumqi. City officials more carefully weigh the water demands of new industrial plants. A proposal to build a coal-to-chemicals manufacturing base near Urumqi has encountered stiff opposition from city authorities who are worried about the millions of cubic meters of water that would be needed each year for operations. The Wei Huadian Power Plant, a 250-megawatt coal-fired generating station in Urumqi, modernized its turbine systems and uses 14 percent less coal to generate one kilowatt-hour, and therefore less water. The plant also installed a heat pump in its boiler system that saves 30,000 to 50,000 cubic meters of water a year. Urumqi also is significantly increasing investment in wastewater recycling plants. The treated water is used by industries, to water gardens, and as gray water to flush toilets. In 2013, the city opened its newest water recycling plant, which more than triples the treatment capacity, from 30 million cubic meters in 2012 to more than 100 million cubic meters. Changing coal-washing equipment — which improves the quality and energy content of coal — with equipment that uses less water, and therefore less electricity to power pumps. Modernizing the boiler ignition systems to use less power. Making sure that the equipment to produce electricity and to use the waste heat to generate steam is operating with ultra-high efficiencies, like combined heat and power processes. Looking for and fixing leaks in seals. Changing boiler systems to incorporate integrated gasification or ultra-super-critical technologies that produce more power with less coal and less water. Substituting smaller boiling units, which tend to be more efficient and less expensive to operate, for larger boilers. Hu’s team then applied these upgrades to co-control methodology to understand the effects of reducing pollution and limiting carbon emissions. The results of these analyses indicate that significant reductions in carbon emissions can be attained by focusing on reducing sulfur and nitrogen oxide emissions. For instance, the team calculated that setting a 40 percent annual reduction goal nationally for sulfur dioxide emissions nationally would lead to a 15 percent reduction in nitrogen oxide emissions and a 17 percent reduction in carbon dioxide emissions. This translates into emission reductions of 12.4 million metric tons of sulfur dioxide, 7.9 million metric tons of nitrogen oxide, and 1.15 billion metric tons of carbon dioxide annually. Coal consumption in Urumqi and Qingdao is steadily increasing. In 2000, Urumqi’s industrial demand for coal was 5.5 million metric tons. By 2011, Urumqi’s annual demand for coal had experienced a four-fold increase to 22 million metric tons, of which 19.4 million metric tons was needed to power electrical generating and industrial plants. Meanwhile, Qingdao consumed 16.6 million metric tons in 2011, more than twice as much coal as the city consumed in 2000. Part of the reason that demand for electricity — and thus coal consumption — is rising is because both Urumqi and Qingdao face water shortages. Demand for water is increasing in these growing cities. So are the needs of limiting pollution and recycling wastewater for other uses, as well as transporting and treating water for drinking. These activities require new and more powerful pumps, as well as electricity-hungry water treatment plants that are powered, for the time being, by coal-fired generating stations. The Xinjiang Deland Engineering Center for Water Treatment, a prominent water treatment design group in Urumqi, estimates that treating one cubic meter (264 gallons) of water for drinking requires about 0.5 kilowatt-hours of electricity. Treating one cubic meter of wastewater requires 1 kilowatt-hour. Recycling one cubic meter of wastewater for other uses requires 1.5 to 2 kilowatt-hours. Water is stored in reservoirs outside of Urumqi. To serve the demand, Urumqi operates 15 water treatment plants. capable of providing 1.2 million cubic meters of water daily in the summer and 600,000 cubic meters daily in the winter. Urumqi also operates 10 wastewater treatment plants, three of which manage purification equipment that recycles wastewater for use in industry, to cool boilers, and to water the city’s gardens. Click image to enlarge. Treated 310 million cubic meters (81.9 billion gallons) of drinking water daily, roughly twice as much as in 2000. Demand is expected to grow to 600 million cubic meters (160 billion gallons) by 2015, according to city authorities. Cleaned up 200 million cubic meters (530 billion gallons) of wastewater daily. Recycled 150 million cubic meters (40 billion gallons) of wastewater daily for use in industrial operations. The engineering center estimated that 1.5 billion kilowatt-hours of electricity, or roughly 10 percent of the city’s power supply, are needed each year in Urumqi to treat water for various uses. That is more than the 1.39 billion kilowatt-hours of electricity that was used by Urumqi’s residents in 2011; it also is the same amount of power that is generated by a 300-megawatt coal-fired generating station, according to figures from the Union of Concerned Scientists. A generating station of that size, according to figures from the Union of Concerned Scientists, will consume almost 1 million metric tons of coal and produce tens of thousands of metric tons of sulfur oxides, nitrogen oxides, and particulates annually, in addition to more than 2 million metric tons of carbon dioxide. Treated 340 million cubic meters (90 billion gallons) of drinking water annually, which is 50 percent more than in 1995, increasing 3 to 5 percent annually, according to city records. Cleaned up to 105 million cubic meters (28 billion gallons) of wastewater annually; also increasing 3 to 5 percent annually. There is, in short, no evading the economically essential and ecologically troubling accord between economic development, energy production, and water. Mindful of the long lifetimes of power plants, the PRCEE’s work to take water consumption into account in its co-control methodology would be essential in convincing China’s cities and its electricity sector to be more mindful of water supply, climate change, and geography when planning new energy plants. South of Urumqi, thousands of hectares of irrigated cropland, most of which produced cotton, have reverted to grass and scrub because of falling water tables. As recently as 15 years ago, water was less than 60 meters beneath the surface. Today, that same water is 120 meters deep. Click image to enlarge. The stakes in choosing a sound water supply strategy for supplying China with electricity could not be higher. The choices that China makes in the near term to define the power sector of the 21st century will reflect a profound reckoning with economic and environmental conditions, which are expected to grow more turbulent unless the world’s biggest nation reins in its energy demand. The Circle of Blue and Wilson Center researchers found that sound judgments, based on new co-control data and operating practices, could compel cities and industries to conserve water. That, in turn, would reduce air emissions and still provide reliable supplies of energy at reasonable prices. On the other hand, poor choices — driven by political and economic inertia, resistance to change, and obsolete and inadequate science and data — will put China in substantially more environmental and economic peril. *PM2.5 is defined as particulate matter that measures smaller than 2.5 microns, or a mere 2.5 thousandths of a millimeter. Congestion is part of the problem causing Urumqi’s air pollution. 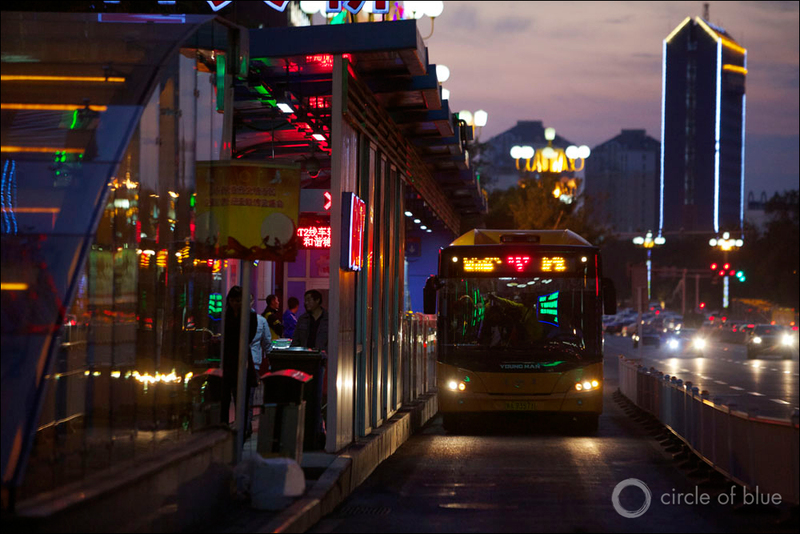 In 2011, the city completed a rapid transit bus system, one of China’s most extensive, to provide an alternative to private vehicles. There are three interconnected lines, spanning 42 kilometers and 55 station stops. Click image to enlarge. Urumqi and Qingdao are fast-growing cities with critical water shortages. Water scarcity is a priority in both cities, due to multiple causes including growing demand, inefficient use, and climate change. With nearly 3 million residents in 2011, Urumqi — the provincial capital of Xinjiang Uygur Autonomous Region, China’s far desert region in the northwest — has nearly doubled in population since 2000. Urumqi has benefited from investments under the Central Government’s 1998 “Go West Campaign,” which has aimed to promote economic growth in China’s poorer inland regions. Infrastructure investments have been a major draw for the inward migration into Xinjiang. In Urumqi, 43 percent of the water supply is pumped from aquifers that are steadily dropping because recharge rates are not keeping pace with use, according to the Municipal Water Management Bureau. 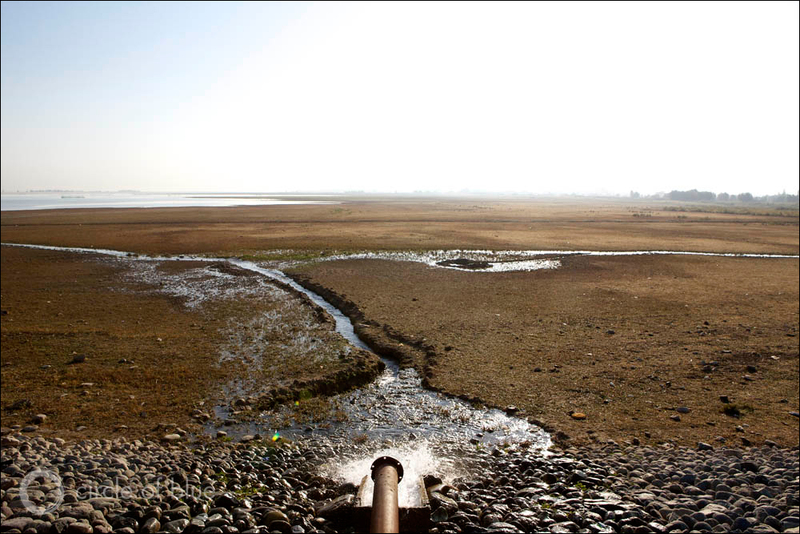 The remaining 57 percent is surface water that is collected in a system of reservoirs circling the city. Both the underground and surface reserves are supplied from water that the city collects from snowmelt and a big glacier in the nearby Tianshan Mountains. Water is transported through a network of concrete canals. Because of climate change, the glacier is steadily receding and the snow line is retreating to higher elevations. South of Urumqi, thousands of hectares of irrigated cropland, most of which produced cotton, have reverted to grass and scrub because of falling water tables. As recently as 15 years ago, water was less than 60 meters beneath surface. Pumps sucked the water out of the ground, using one kilowatt-hour of electricity to pump one cubic meter of water to the surface. Today, that same water lies 120 meters deep. It now takes two kilowatt-hours of electricity to pump water to the surface, municipal authorities told Circle of Blue. Doing so requires larger pumps and bigger energy budgets. 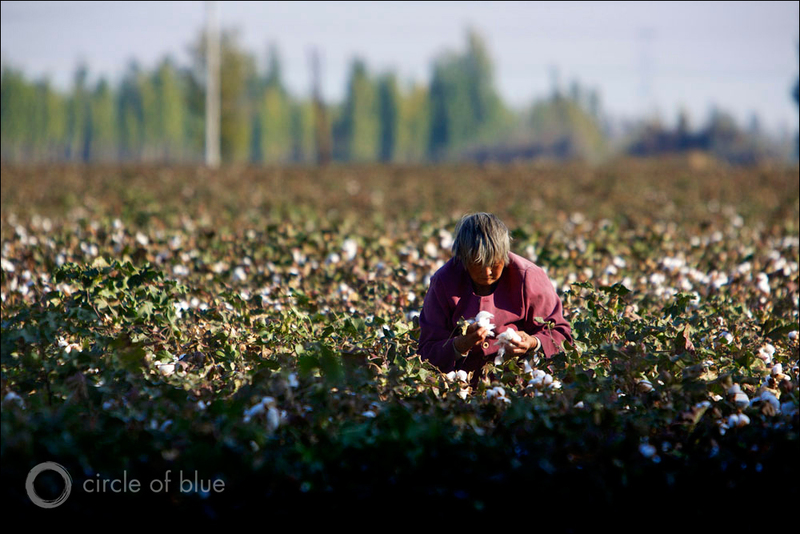 Since 2004, cotton producers have steadily abandoned the land because of the higher costs. Similarly, Qingdao also contends with a growing water shortage. Qingdao’s 2011 population of 8 million is growing by almost 80,000 residents a year, according to the city’s statistical bureau. Industry uses 40 percent of the water supply, but the growth in the number of residents — who use the remaining 60 percent water supplies — has been primarily responsible for driving up water use. The city now uses 450,000 to 500,000 cubic meters of water daily. In 2000, Qingdao used 300,000 cubic meters a day. From 1990 to 1998, water use in Qingdao increased 5.35 percent annually, according to the Qingdao Municipal Engineering Design and Research Institute. From 1998 to 2007, water use in the city increased 12 percent annually. Most of the city’s water supply — 65 percent — is transported in concrete canals from the Yellow River and stored in reservoirs. The city has a fixed amount of water available from the river because of a quota system that was instituted by the provincial government in the 1990s. The balance of Qingdao’s water comes from rainfall, 500 millimeters to 900 millimeters (20 to 35 inches) a year, which can be erratic. The result is that the city’s annual water supply is 850,000 cubic meters, or about what the city used in 2010. By 2020, water demand is expected to grow to 940,000 cubic meters. This leaves a potential shortfall of 90,000 cubic meters of water that the city simply does not have.